QolorPoint® Wireless LED Uplighters by City Theatrical were recently used to illuminate The Spheres on Amazon’s campus in Seattle, Washington with a purple lighting display to celebrate 100 days until Seattle hosts the 2018 Special Olympics USA Games. 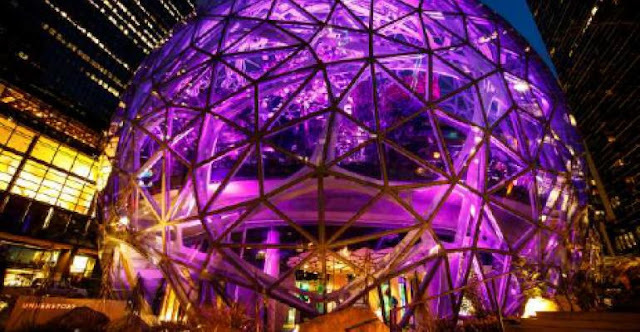 Twenty four QolorPoint Wireless LED Uplighters were set up within the 4,000 square foot grounds of The Spheres to create high intensity colored lighting effects that could be seen citywide through 2,643 panes of glass. In addition to the intensity of light provided by the uplighters, the fixtures were selected to light The Spheres for their high level of portability and IP65 rating to protect against water and humidity used to nurture over 40,000 plants in the three massive domes. The uplighters will also be used for future events in The Spheres. The QolorPoint Wireless LED Uplighters were controlled by plug and play wireless DMX technology with SHoW DMX SHoW Baby® 6. The lighting package was provided by Barbizon Lighting Company's Denver offices.